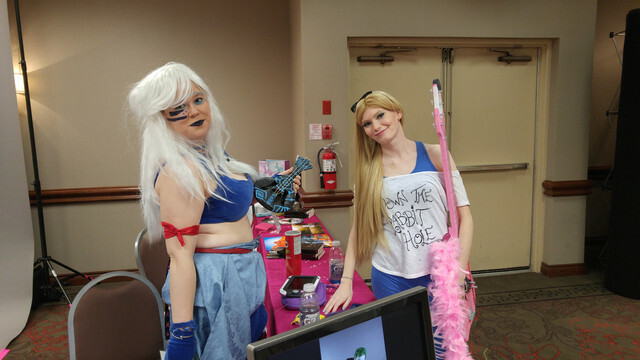 Well...as I said last report my long road convention reports are done...but I also said I’d do local conventions and one came up right off the bat to kick off 2017 in the cosplay convention FrostCon! The 404s had 2 shows with a workshop for crowds that ranged from 25-40 attendees from this close-knit community of cosplayers in the area, as about a few hundred overall people came throughout the 2 day weekend convention. This fit in a starting lesson about the Alphabet and counting with A Number of Words. The audience got into the action with suggestions but also a few coming on stage like for Moving People to help move the actors in a science fiction cosplay making scene, being one of the Dead Bodies aiding in making a cake out of magic, and filling in for lines in Pillars for making a video game. There were mysteries to solve like with Murder Telephone about a murder in Gotham, and a Press Conference that dealt with Pokémon Go. Yuri on Ice was still very popular that it came up during this show and the Late Night show, but for this one it was told in a minute then half of the time each repeat. There were several Cyrano wooing scenes as both shows had them. Swedish was used in presenting a Foreign Film Dub. Shapeshifting became a cosplay super power to see over and over in Forward/Reverse. There were even brave Superheroes tackling the issue of lost internet memes that was a roller coaster of emotions until resolved. Action came up on stage too with Stand, Sit, Fly and Touch to Talk. 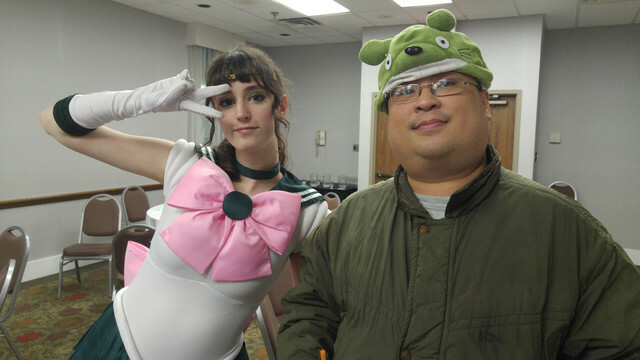 The cast got to present scenes as a group like Questions Only during a convention event, Objection on the topic of cosplay being bought or handmade and World’s Worst topics, to doing so in smaller numbers as well like storytelling with Authors and Characters, 3 Nuggets and One Word Story. The Late Night show used Cards against Humanity to help the audience choose a mature topic for most scenes, and ended with the LEGO Minefield game. The Sunday Workshop had some added fun thanks to special guests D. Piddy, a cosplayer from the USA from whom I got a photo and an autograph, and Dr. StEvil who is a local character actor. D. Piddy’s video is at https://youtu.be/FHAHtGjHvWs while Dr. StEvil has his video and more at www.youtube.com/chattingwithstevil Everyone got to try various practice techniques that help with various areas of acting from focus (via Clap Focus) to character building (Character Walk, Goaltender). By the end a mini-show was done with the participants of the audience involved and they got into the fun with the actors! Going around the convention there were many panels as I attended one with various local cosplayers who were guests talking to others about becoming a part of the community and not being afraid to dare to cosplay however one wants! They also had a Masquerade with some impressive entrants from a Xenomorph from Aliens to various cast members from Yuri on Ice, Magi and Pokémon among others. *Lollipop Lollipop had a bunch of different finds. Sprite Tropical was easily the best find with it being like a Tutti Fruity or Shirley Temple taste, while the Tropicana Hawaiian Punch Soda is pretty much a carbonated fruit punch but it was also quite good. White Twix was ok but White Chocolate Kit Kat was excellent! The Megaload Peanut Butter and Grape Cups were ok if a bit tart. I got later on the Strawberry ones and I liked them more being a nicer mix of sweet and salty. I also got a refill of my usual supply of Hi-Chew; I like Strawberry, Grape and Green Apple the best and when I can find it the special Litchi flavour. I also got a Cadbury milk chocolate bar and a Lion chocolate bar as a gift. *The latest T-Shirt from Chop Shop Goods at https://www.chopshopgoods.com/ bought was a Dimple in a drawn breast pocket Mob Psycho 100 design. *One of the best finds was from Sci Feye Candy at http://scifeyecandy.wixsite.com/scifeyecandy was a leg pouch that I use for my tablet and other electronics. It fits just right, is secure when wearing it out and the simple camouflage colouring is appealing. *There were a bunch of artists present from the area. Pop Pixel Art was where I got my change pouch keychain, another Pokémon Master Ball knitted very nicely. A pair of artists at a table, ashly p at http://halfdeadsketches.tumblr.com/ and Roo’s Draws at http://halfdeadsketches.tumblr.com/ made some nice stickers of Mimikyu from Pokémon Sun & Moon and Onoda & Kinjou from Yowamushi Pedal. Storm Cup Creations at http://stormcupcreations.storenvy.com had some nice stickers as I added Victor from Yuri on Ice to my collection. Finally from ceephor studios at https://www.storenvy.com/stores/47791-ceephor-studios I got plenty of stickers such as JP Polnareff, young Joseph Joestar and Lisa Lisa from JoJo’s Bizarre Adventure, a Gastly Pokémon, Saitama and Genos from One Punch Man, as well as a mini Genos baking sketch. As noted from my previous blog and in the introduction, for 2017 and going forward I’ll only be attending local conventions. So in a nutshell the post-convention reports for the longer road trips are retired but these local ones will pop up when I’m free and able to attend then write about them. Thank you for your time! Thanks for reading and enjoying the convention report! Last edited by Haruhifan; 02-13-2017 at 03:30 PM. Great pics! Looks like fun times!